• I got swamped last night during my chat on Peralta questions. I just didn’t know much about him so I went and watched his debut. • It looks weird in that he is nearly falling down on every pitch and just averaging 90 mph on his fastball. It reminds me of high pitchers trying to reach 85-mph. Note: Hopefully this week, I’m following up on this topic. 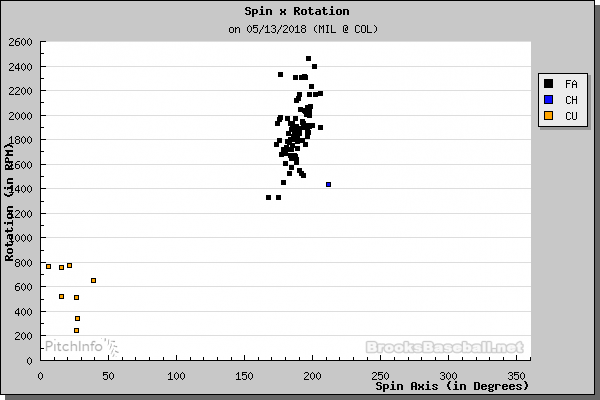 I’m not sure what is a normal spin variation. His pitches deviated by almost 1000 rpm. The hitters seemed to have problems picking up it up. It’s tough to know his deception when watching him pitch from the rear camera angle. Here’s a look at some of his fastball variations. Here’s a two-pitch back-to-back combo with one cutting away and another straight and high. • Curve/Slider. 77-81 mph with 12-6 movement. He had no feel for the pitch. It was all over the place. • Scouting reports put him with an above average change-up but he never used it. • He threw his fastball almost 90% of the time so hitters may start getting to it the second or third time through the lineup as they see the variations. • He got rocked a few times with Charlie Blackmon just missing a grand slam foul. Overall: He has no room for error or degradation. No extra velocity. Not even a serviceable second pitch, yet a third. His control won’t get better because he falls off the mound pitching. The max effort delivery means he’s at his max velocity. I don’t know if I’d start him in his next start. The fastball works and that’s it. It’ll be interesting to see if he just didn’t have his breaking balls or they don’t exist. I’m trying to think of a comparable pitcher and Bartolo Colon is all I have. It’s an effective fastball but that’s it. How many starters get by with just their fastball? Hold and bench for now. 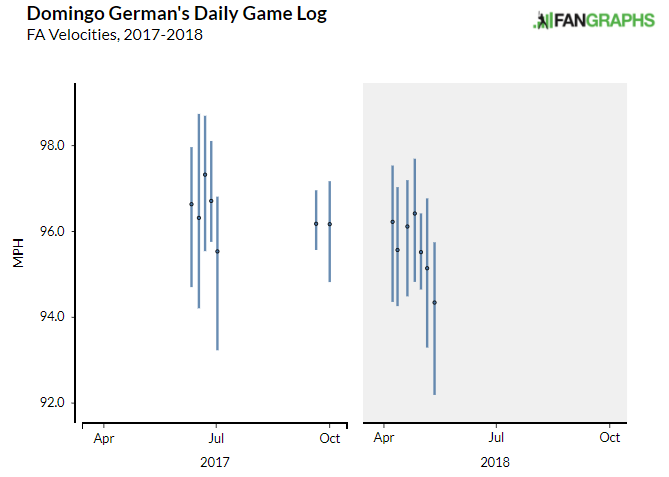 • I was hoping German didn’t throw at Yankees Stadium because the camera angle is offset but no luck. I decided to go ahead and watch his second start even though his pitch’s horizontal movement will be tough to see. • Fastball: He’s got two, four-seam and sinker, and they’re weird. His sinker sits 93 to 97 mph while ith his 4-four-seamer is couple ticks slower at 92 to 96 mph. Normally, pitchers can throw their four-seamer faster. The other item is that his sinker has more spin than the 4-seamer. Again, this is backward as four-seamers normally have more spin which gives them their “rising” action. Also, his fastball velocity has dropped in each of starts since moving from the bullpen. This decline is common with the move as Jake Faria (’17) and Danny Duffy (’16) saw similar drops when they transitioned mid-season. His drop may be done has MLB.com reported that he sat at 94-mph as a minor league starter. • Curveball: Sat 80-83 mph with a 12-6. It seemed fast as it only varied 12 mph from his fastball. It’s at least an average MLB offering and he used it quite a bit in his last two innings. • Change: A straight 86-87-mph change with some drop at lower velocities. It’s unique with its high 80’s velocity which is only 4 mph to 7 mph under his fastball. It seems like a pitch which will get crushed if timed right (Khris Davis launch one for a home run). Overall: German is not someone I’m targeting to own. The skills seem OK. His fastballs are acceptable. His curve is great. And the change might be great when he’s throwing 97-mph out the bullpen. He’s not in the bullpen now and his fastball velocity is still dropping to a starter level. As his starter talent level becomes visible, owners will get a better idea of what to expect from him on a weekly bases. For now, I see him a streamable option whose value could change significantly over the next few starts. We hoped you liked reading Quick Looks: German & Peralta by Jeff Zimmerman! Nice write up on German. Thanks.